Cameroonian timber from some of central Africa's most biologically diverse forests cut illegally and sold off to manufacturers in China. This photo is from 2007 but the practice continues today. Irène Wabiwa is based in Johannesburg, where she is a Forest Campaign Manager for Greenpeace Africa. She studied at the University of Kinshasa in the Democratic Republic of the Congo. Cameroon’s rain forests are rapidly vanishing due to widespread corruption, according to a new report from Greenpeace Africa. 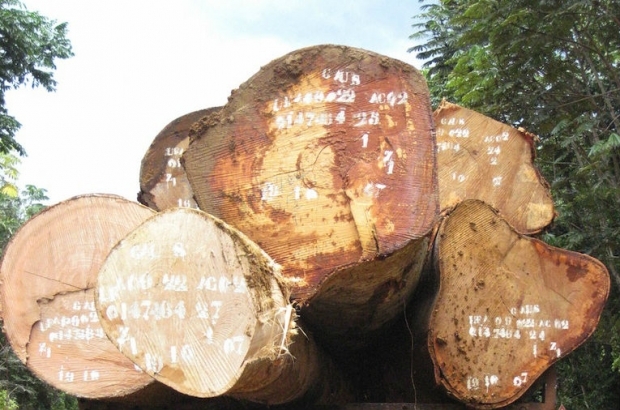 The environmental activist group alleges that much of the illegally-harvested timber from Cameroon ends up in China where customs authorities look the other way against suspicious timber imports. In fact, the Chinese do not have any laws against illegal timber imports and Greenpeace claims that is one of the main reasons for the clear cutting of Cameroonian rain forests. Greenpeace Africa’s forest campaign manager, Irène Wabiwa, joins us to talk about China’s complicity in Cameroon’s illegal timber trade.